Sorry, contest closed 5 October, 2018. The holiday high season is almost over, but warm weather, world-class waves and award-winning tattoo artists in Bali make this idyllic island welcoming and worthwhile for wanderlust, whenever. 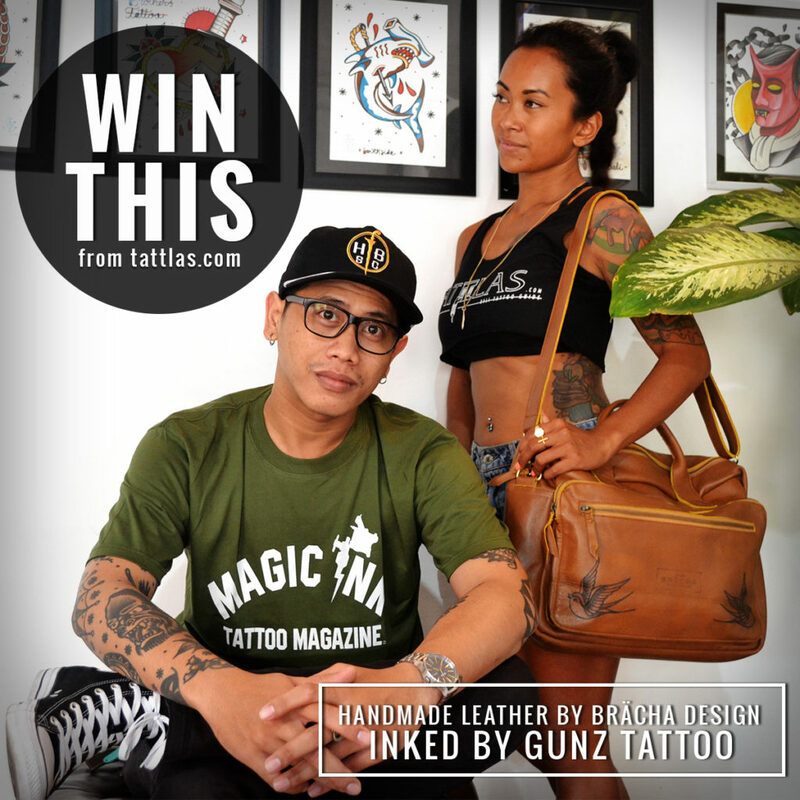 TATTLAS Bali Tattoo Guide is giving away a very cool prize to prepare (one of) you for effortless tattoo travel in the tropics, anytime. 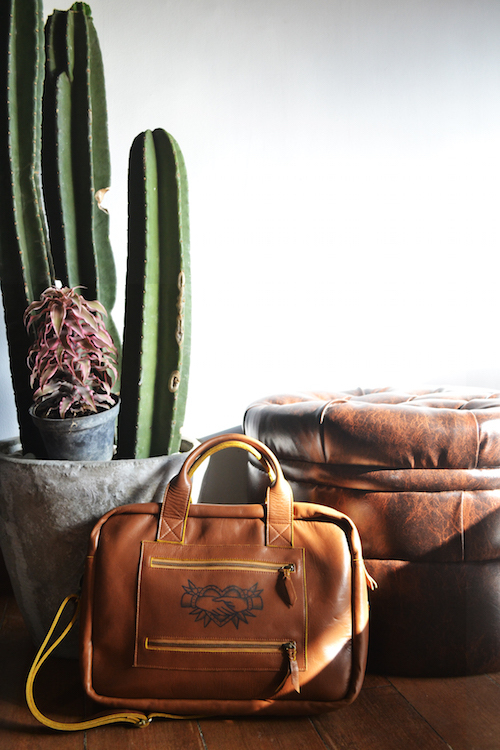 1 x Brächa leather bag inked by Gunz Tattoo! With this, jet-setters and wandering wannabes can be prepared and organized anywhere. Tattooed Leather Bag (front)Our one-of-a-kind custom tattooed leather bag has a Gunz Tattoo of two swallows on the front and a handshake design centered on the back. Guntur needs a bag about a hundred times larger than this one because he brings home massive international tattoo show awards regularly. Like backstage passes to being cool in Bali (your only alternative is driving a vintage Vespa). 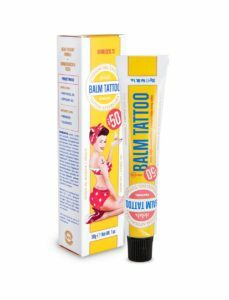 Nourish, protect and keep tattoos looking fresh. 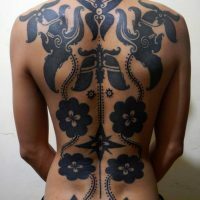 Woohoo, Bali tattoos! Dream holiday, right? Wrong. Sorry, here comes the reality check. 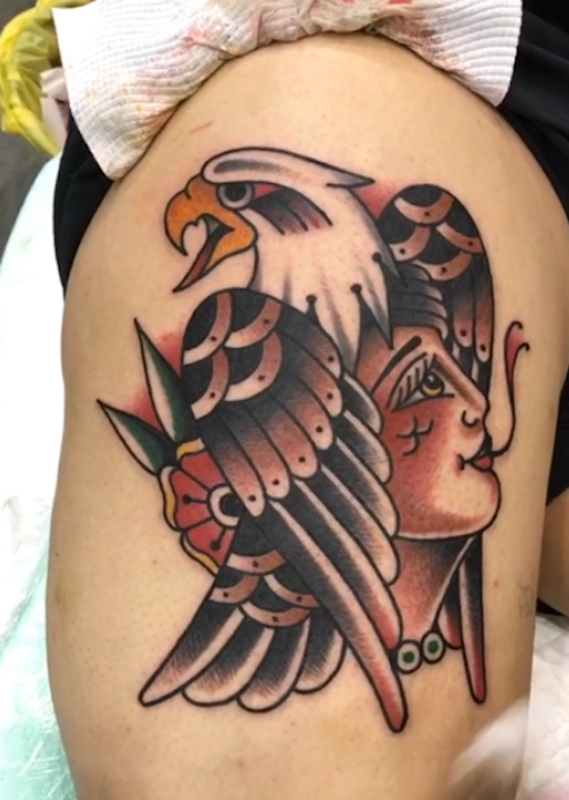 Caring for new tattoos in an exotic life-changing locale is doable and totally worth it but requires your real attention. 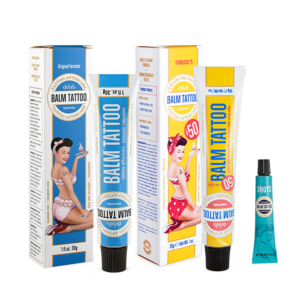 Know your tattoo care stuff, so all the sunny memories, life achievements or identity pride represented by your new tattoos don’t get caught up in a stormy sitch and sink those skin-deep designs to new depths of despair. Don’t swim, don’t get sweaty, don’t get caught in the rain, don’t shower for too long. Don’t use an irritating soap. Don’t have too many Bintangs. You need to keep this baby out of the equatorial sunshine and then deal with the itchy healing phase (do not scratch!). The need to carry your plane tix, passport and weeks’-worth of possessions from beach to beach does not make this any easier. THIS IS WHY YOU NEED OUR KIT. GUYS. #WIN (and if you’re new to this, forget about looking cool and collected without it). That’s a talent only the toughest tattoo travelers have mastered — those who know too-well the cost of replacing hotel bed sheets ruined right after a rough inking session / in-limbo bloggers who love lettering tattoos and lug laptops to Lembongan / ladies who look for little things in your luggage for literally like an hour LOL / perfect Pilates people pioneering the no-plastic path for mission Save Our Planet and would really like to find hand-poke tattoo places in Pengosekan or Pererenan: legends all of you. 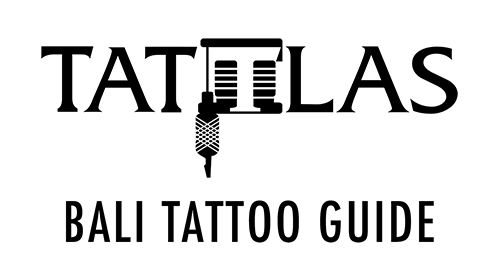 + Prize delivery limited to Indonesia, Singapore, Australia, New Zealand and U.S.